Birding and bird watching tours and guides in Mexico. Our company is dedicated to personal birding & cultural tours throughout this amazing state of Oaxaca. 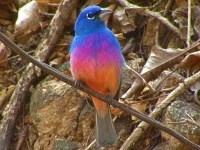 We have been offering to our guests the best of Oaxaca Birding. We specialize in customized birding & cultural tours, for individuals & small groups, our emphasis is on professionalism, reliability & personal attention. All of our programs are available throughout the year and are flexible to accommodate your special needs. Roque Antonio Santiago, Owner.